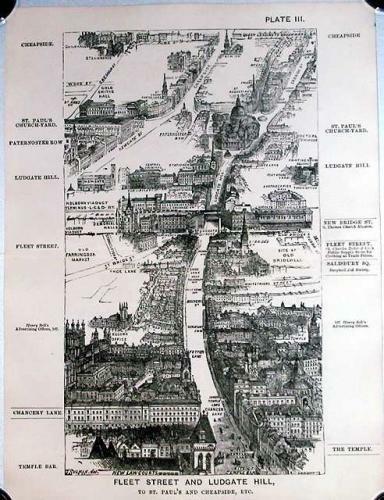 SOLD London in 1887, Plate III, Fleet Street and Ludgate Hill, to St. Paul's and Cheapside, etc. Title: London in 1887, Plate III, Fleet Street and Ludgate Hill, to St. Paul's and Cheapside, etc. Publication: London in 1887. Author: Fry. Herbert, Engraver: Sulman. T, / Quick. W M R.
A panoramic bird's eye view of Fleet Street from the New Law Courts to St. Paul's Cathedral. The buildings have been engraved in extraordinary detail. Scarce.